Last weekend someone asked me, "Do you have a simple, no-brainer, quick peach dessert?" Why, yes, I do - a peach crostata! Just crust and fruit. It is the epitome of a simple summer dessert. 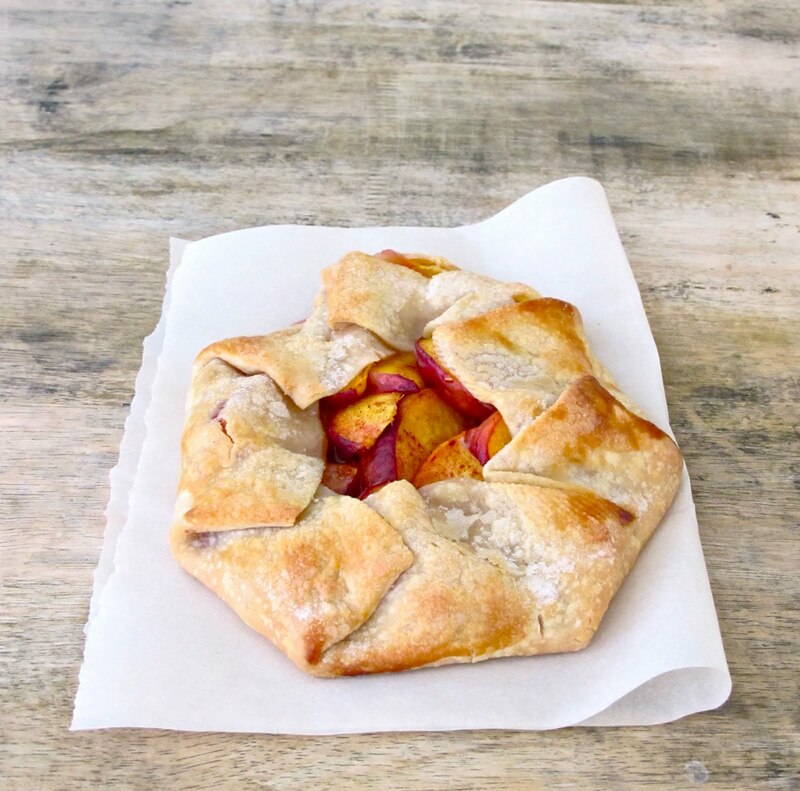 A crostata is a rustic tart/pie/pastry made directly on a baking sheet with parchment paper (see my favorite pre-cut parchment sheets here, 200 for $12), with fruit piled into the center, then the edges are folded up. There is no pie dish, tart pan or spring-form pan to clean, and if you use the parchment sheet while baking, you just have give the baking sheet a quick rinse when you're finished. What else makes this so simple? 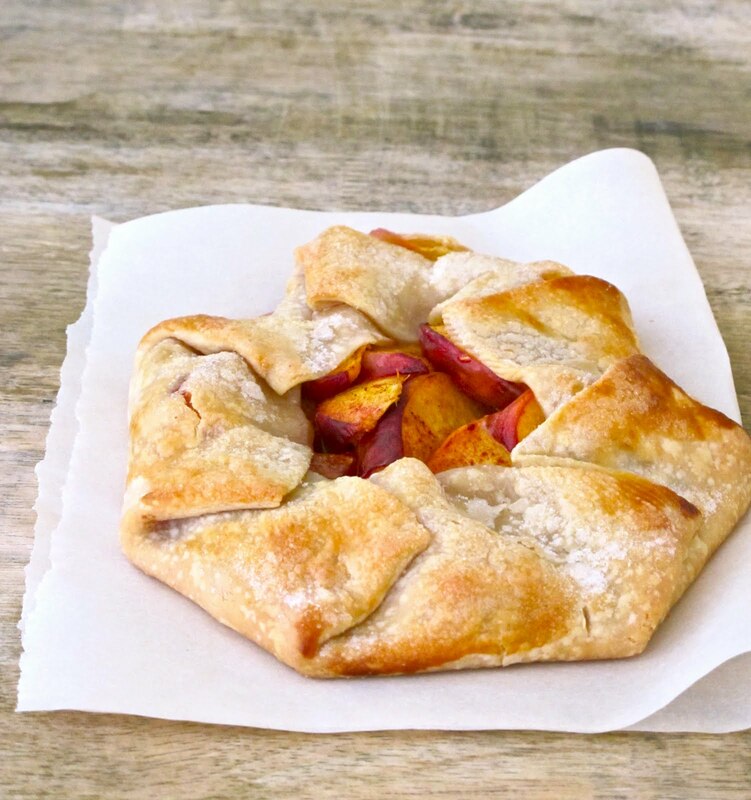 You don't have to the peel the peaches, and you can even use store-bought pie dough. It only bakes or 15-20 minutes, unlike a 45 minute pie. I mean really, could there be anything easier? Oh, I forgot to mention that it is delicious, too. The flaky crust coated with sugar, filled with warm cinnamon sprinkled peaches is magical. The short baking time allows the peaches to stay firm and fresh, instead of getting over done and mushy, as sometimes happens in a pie or cobbler. The Peach Crostata is part of my Farm to Table Dinner Party Menu & Farmer's Market Table Setting. To see the entire menu, click here. Roll out pie dough into a 10-12 inch circle. Pile peaches into the center. Sprinkle 1 tablespoon of sugar, the cinnamon and the nutmeg over the peaches. Dot the peaches with butter. Fold up the sides of the dough. Create an egg wash by beating 1 egg, then brushing it on the pastry. Sprinkle the remaining 1 tablespoon of sugar over the dough. Bake at 425 for 15-20 minutes. The pieces of butter combine with the peaches and sugar to make a little bit of sauce in the crostata. Fold up the sides, pinching it together. I like a good amount of sugar (about 1 tablespoon) on the outside of the crust - when it bakes it makes a sugary crust that is perfect with the warm peaches. On the baking sheet ready to go into the oven. I highly recommend serving it with vanilla (or cinnamon?) ice cream - yum! The Peach Crostata is part of my Farm to Table Dinner Party Menu & Farmer's Market Table Setting. 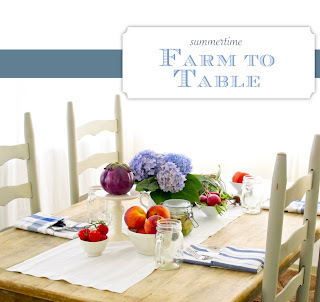 To see the entire menu & table setting, click here. I just bought a 1/2 bushel of peaches. I froze some, but was looking for what to do with some of the others. Perfect!! Now...to perfect that crust. Thanks for the recipe. I love a simple galette! Yours is lovely! This looks fabulous! 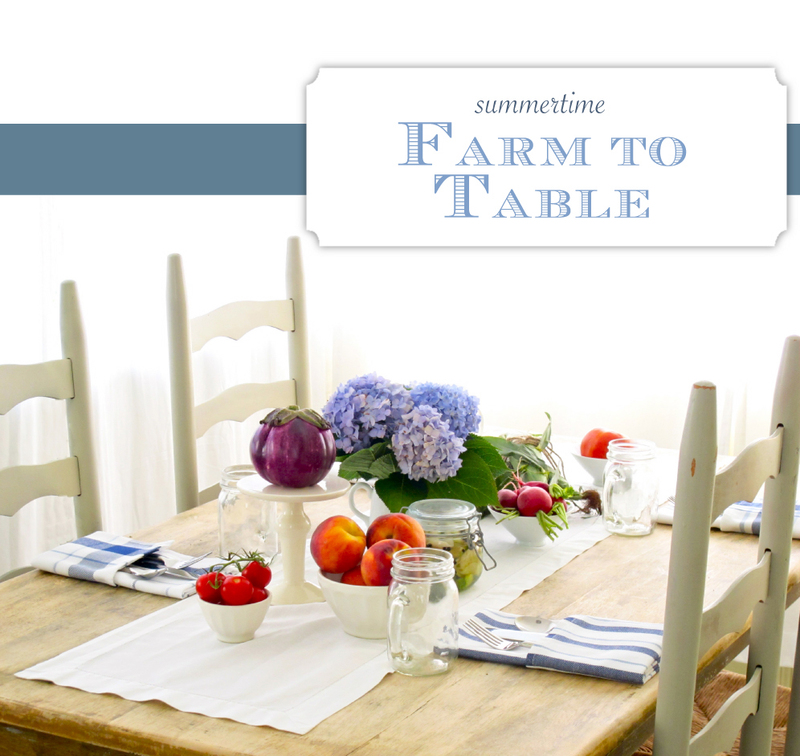 Love your Farm to Table posts! I have never heard them being called a crostata, they are always called galettes here. Crostatas are something else. Thanks, Everyone - I'd love to see photos of yours, too! As for the debate, galette vs. crostata, I started wondering... what is the difference? I did a little google search and came upon Apartment Therapy The Kitchn's reply. "Turns out, a galette and a crostata are essentially the same thing (one French, one Italian). Crostatas and galettes are typically free-form and rustic, with the dough edges folded up around the filling, which can be savory or sweet." I guess I gravitated toward calling it a crostata because I tend gravitate toward rustic Italian food! Its beautiful!! I'm attempting it tonight! 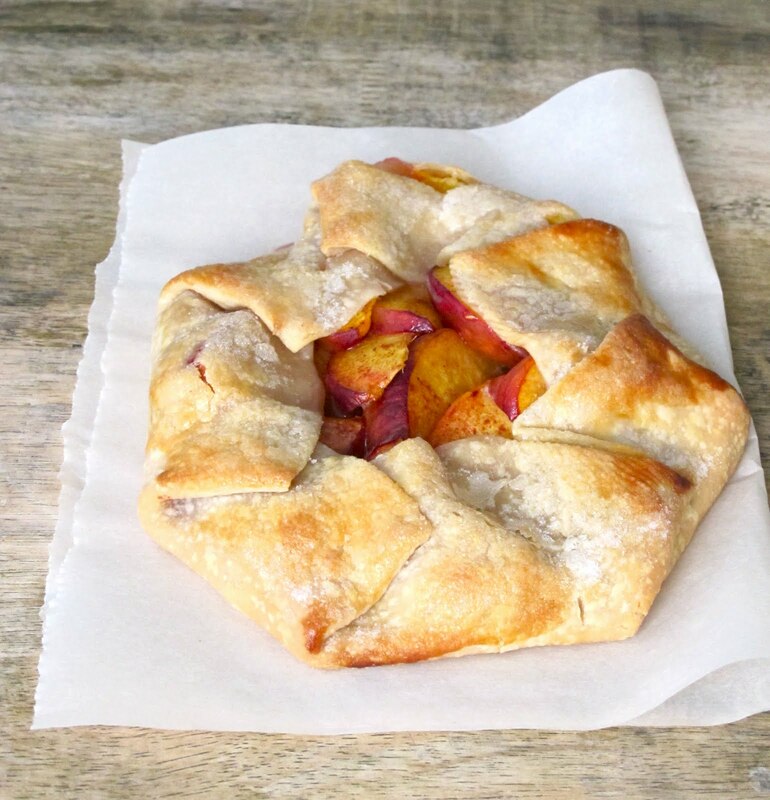 Jenny, I am loving your peach crostata and will be linking to it tomorrow. the bottom of my crust was a bit doughy. i used parchment paper. any thoughts? You may have needed to increase the baking time, for whatever reason. Also, since we're really getting into the height of peach season, the peaches you used could have been a little too ripe - or just riper (??) than the ones I used at the beginning of the season. Riper peaches tend to have more juice, which could have left your crust soggy. Second recipe of yours I made this week. This came out perfectly. So easy and delicious! I found this on Pinterest! I'm doing a farm to table menu this Saturday, Cool Cucumber Soup, Corn/Blueberry Salad, and now this! YUM. I might copy your last commenter and make 4 small ones instead of one big one. Found this through Pinterest as well and this was a super yummy treat for summertime. Not too sweet and lighter than cake, but more than just a fruit salad. I made two and they went quickly in my house. Thanks for the recipe! :) Can't wait to try more. I've made these with apples before and they are just so rustic and cute. and tasty! and easy! i made mini ones about 5 inches across maybe to take to a fall party. perfect thing to take to a party.